I have my own theory of why holidays are stressful. In our home, we celebrate Christmas, but the ‘psychology’ of all holidays is very similar – if you have strong feelings around Halloween or Rosh Hashanah or National Spaghetti Day, for instance, the same process occurs. Holidays that are celebrated from childhood stir up the psyche in a very powerful way. The psyche loves cycles, and we humans tend to circle back to emotionally charged memories of events that occur every year. We naturally reflect on what was, what is now, and whether or not we’re ‘measuring up’ to our hopes and dreams. Last week I hauled a box of ornaments up from the basement and sorted through the baby shoes, the graduation cap tassels, old wooden stars that my dad had cut with a jigsaw when I was 2, and a gilded macaroni encrusted frame holding a photo of my son at age 3. And then, for some reason, I was irritable all evening and had an unnaturally strong hankering for Doritos. Almost everything that we ‘always do’ at Christmas has the power to evoke in me a gut punch of feeling – from grief (Dad’s gone, now) to yearning (my son is doing well, but he is not well enough to travel), to tenderness, to gratitude and joy and excitement. All this is a tumble of re-experiencing that I have little time to process, what with wrapping and decorating and menu-planning and 4 kids, 3 dogs, 8 horses, and so on…. I’ve learned through the years to honor what my psyche wants. I use the word, ‘psyche’ because of my Jungian background, but you may be more familiar with the word, Soul. Or, Heart of Hearts? Or, Essential Self? I’m referring to that eternal part of you that knows what is important. Menus and ribbons and wreaths are not important to the Soul. Honoring the cycle of love and learning in our human lives IS important. In the Soul’s experience, it’s really all there is. The Soul yearns for ritual, for the cyclical honoring of what was, what is, and what will be. I truly believe that’s why we give thanks before meals or light candles at Seder or recite the same poem on Christmas Eve. It’s why we serve the traditional sweet potatoes or keep scrapbooks or treasure what was Mom’s or have trouble throwing some things away. It’s why walking the Labyrinth at Blue Star Ranch is how we end our workshops – allowing a way for the Soul to integrate what the workshop has shifted in our thinking and feeling. The Soul demands conscious ritual. If you do not consciously honor this need, then you’re in for unconscious fallout – in the form of unexpected sadness, or anger, or a pervasive sense that what you do is never quite enough…. There’s a Shadow side to frenetically following all traditions, or doing things you don’t really want to do, or doing what Dad says even though you’re furious with Dad. Ritual can take hold and keep you captive if it’s unconscious or compulsive or exhausting. So, what to do? Try this: Make your own rituals. Take some time (Soul doesn’t need hours; it’s calmed within a few minutes! ), find a candle and a favorite poem or mantra or quotation, and develop your own way of beginning and ending your day. Maybe keep your candle or a favorite ornament or charm on your nightstand? Or on your desk or bookshelf. Develop your own comforting words and gestures, such as a hand on your heart in gratitude or a bowing to Spirit. The ritual of centering yourself, over and over again, soothes the Soul in an incredibly powerful way. What’s unimportant fades, and what’s important is honored. As you become accustomed to paying attention to what your Soul wants, you can develop other rituals for yourself and your family that honor your history, your connection, and your future. Ditch the big meal for a beautiful night in a favorite restaurant? Choose a toast that gets repeated at family gatherings? Ask the youngest to offer grace? Go around the table and ask each person, What do you really, really want to happen in your life in this next year? As you practice your own rituals, you’ll find energy abounds for the demands of your holiday. And when your energy lags, go back to your ritual. Consciously acknowledge what is really important. Slow down and enjoy, or not, and just let yourself feel. Let the flowers wilt and let the dirty dishes wait. (And naps help, too!) You’ll get back to your ‘to do’ list soon enough, with even more energy, if you take good care of yourself along the way. I wish you and yours the joy that comes from honoring all of your experience this holiday season! 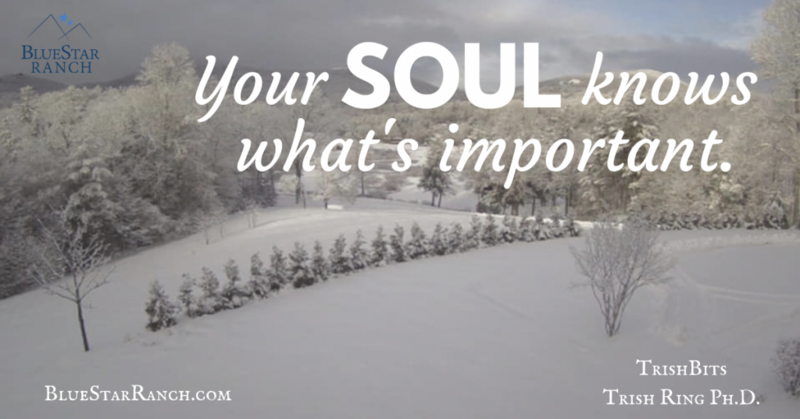 The Soul knows that it’s all very, very good…. About 3 years ago, Carl and I were walking our newly acquired 100-plus acres in the Blue Ridge Mountains. We dreamed of a little round pen, a pasture, a couple of horses, and maybe a one-room cabin nestled in the pines on the hill. Today, that little dream has become 160-plus acres that is home to a 17,000 square-foot retreat center opening April 1 for visitors’ meetings and dining, offices for our growing Team of staff members, and our own apartment overlooking Yellow Mountain. Plus 5 pastures, 3 arenas, 2 barns, 3 guest cottages, and more plans in the works. Not to mention our custom labyrinth, cutting garden, and tree farm…. People ask me, “How did you do it?” They’re curious about how to take their own yearnings into the world of physical reality. Some want to know how to ‘manifest.’ Some want to know where this crazy dream came from in the first place. Some are interested in how to write a business plan, how to find staff and horses (whatever their ‘horses’ may be), or how to create a vision. I don’t really know much about business plans – though I’m learning. Nor am I an HR expert – but I’m getting better at making good hires. There are lots of talents and skills that make ‘manifesting’ easier, such as Carl’s engineering brilliance and my intuitive sense of what we need in order to ‘hold space’ for our guests. It also helps to be retired with grown kids; much of this is about divine timing. And it helps to spread your vision, which happens naturally when you feel great passion. It makes marketing a cinch. It helps, also, to remember to value those times when all is not going particularly well…. We have made so many mistakes! From the ‘eagle view’ of divine timing, you can value the times that you got off track, found yourself stuck at a dead end, or made a poor decision. What were those mistakes ‘for?’ They were for YOU. To learn what you needed to learn, to practice getting back on track, to know what you needed to know in order to get where you’re meant to be. When inspiration strikes, it helps if it finds you working. It’s the day-by-day, step-by-step ‘doing’ that makes our dreams come true. When you follow your heart, and put energy into exploring options and seeking expert assistance, then your next task is to work and work and work. Not the kind of work that is frantic, or drudgery – but it is work, nonetheless. Creative, occasionally tedious, sometimes routine, frequently inspiring, and often thrilling WORK. Here’s to your dreams, and to right timing, and to your very own ‘chair.’ Make those dreams come true…. I used to go into frantic overdrive at Christmas time. Particularly during those years when I felt especially vulnerable, like right after my divorce, or right after my remarriage. I worked hard to give the kids a ‘best Christmas ever,’ and to meld a family that was not quite ready, and to distract us from the reality that this might be my Dad’s last Christmas. Matching outfits for kids & pets, photo ops, handmade and homemade everything, scrapbooks & special crafts & so much to attend to that I didn’t pay much attention at all to what was really important to me – those quiet moments of connection and humor that make my family so dear to me. All the while that I thought that I was trying to make other people happy, I really think, in hindsight, that I was trying to make myself feel better. From this place in my life where I’ve found such peace, I can truly say that we can’t make people happy. But we can BE happy, and our being who we truly are is the greatest power within our reach. Because joy is contagious! But what if you are feeling anxiety, or dread, or loneliness? From Chanukah to Christmas to New Year’, through all the parties and even solo evenings this season, you have tremendous power over how you will feel about this holiday – before, during, and after. Spend some time in reflection about how you WANT to feel. I’d estimate that most, if not utterly ALL, of what we do as humans is designed to make us feel a certain way. Do you want to feel connection, relief, safe, joyful, rested, calm, energized, loved, accepted, inspired? Imagine what will get you to those feelings. Just write all the stuff down that you think you need to make yourself happy this year. Now look at that list, and consider this question: How much of what I want depends upon me, and how much depends upon others? This is a critical juncture in the process of claiming your own joy. If you imagine that you need your miserable old grandpa to lighten up and stop with the sarcastic comments, then you are at risk for depending upon HIS behavior in order to be happy. Instead, focus on your own Circle of Influence. And, if you imagine that all the food, gifts, décor, traditions, and outfits must be perfect – again, what for? Why? Will it truly get you what you want to feel? Use your Influence. Once you know what you wish for, then make it happen. Make plans for what gives you joy, and take the time to retreat, or gather soulmates, or bring a favorite dish, or light a candle or make a wish or offer hugs. Regardless of others’ blind spots, nuttiness, or Scrooge behavior, this is YOUR HOLIDAY. It’s for you. If Grandpa gets on a roll with the sarcasm, you don’t have to listen, or stay in the room, or take it personally, or ‘catch’ the contagion of despair that is at the root of such meanness. It’s all his – so let him have it. Seriously question your beliefs about how this holiday ‘should’ be. Those ideas will keep you trapped in misery without your even realizing it. Let go of the idea that you can ‘make people happy,’ and, instead, consider that you can ‘share joy’ with others, who may or may not be able to join you – right now – in that joy. 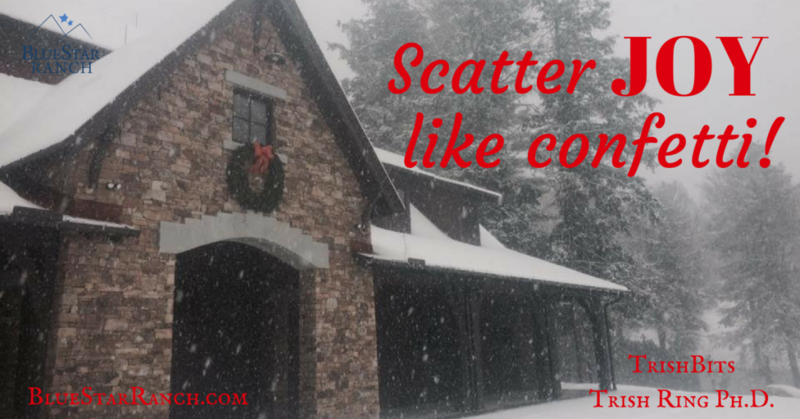 Scatter joy like confetti! That’s the PERFECT question – and here’s what I know – without a doubt: When you thoroughly accept and love your very own self, then people just shower that love right back atcha. Seriously. Give it a try. And, finally, our holiday rituals derive from an age-old human need for connection with our cultural and family history, our connection to the divine, and our search for belonging in the seasons and elements of this planet. Take time to be still, in the light of a candle, and find your place in this vast universe. I love you, and I feel for you, and your journey is not mine. It took a LOT of practice – and the universe sent me a relentless series of opportunities to learn it, but it finally stuck. I’m offering this to you as we move into winter holidays, when families gather, and we have fantastical visions of sugarplums and homecomings full of laughter and such. The most reliable way that you can actually enjoy your loved ones is to be very clear that your empathy is a gift, but your frantic intrusion into problems in order to ‘fix’ them is not. Yes, you may disappoint people who are dear to you. But, if you are clear about what IS your business, and you take good care to follow the wisdom of ‘you be you,’ then you may just be the best gift EVER to your family, friends, loved ones. You are not on this earth to take others’ tasks away from them. 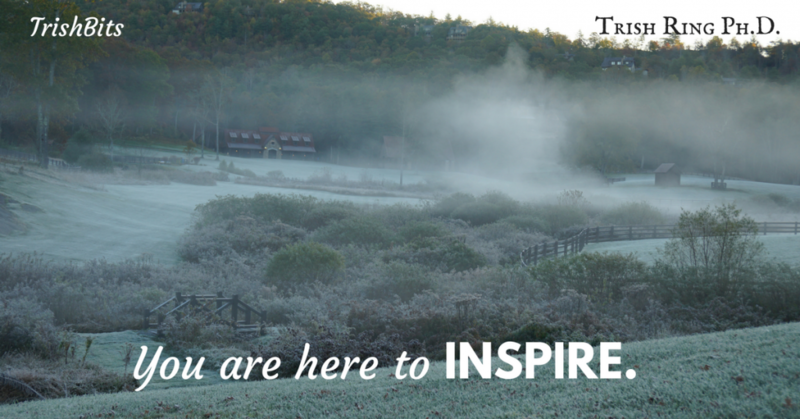 Instead, you are here to inspire them. 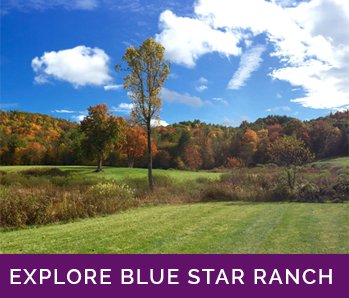 At Blue Star Ranch, we invite visitors into the arena to do groundwork with horses. The horses do what horses will do – sometimes they mosey along at a slow pace, sometimes they run around, sometimes they jump and play. If you’re not familiar with horses, all this can be a little bewildering. 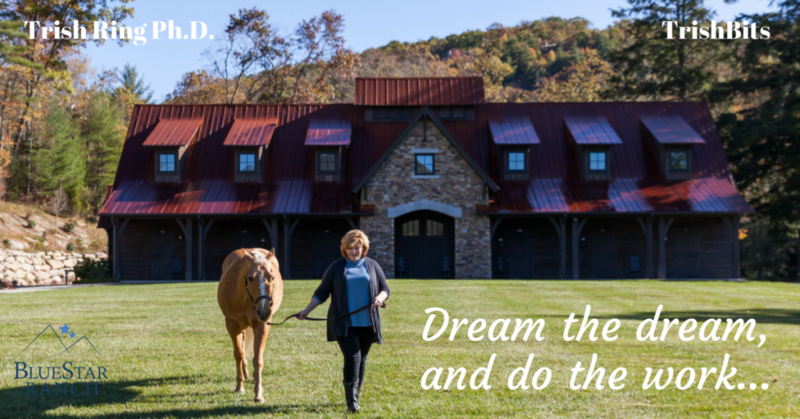 But with plenty of coaches around, we offer support and instruction and a linked-arm technique for teaching you how to calm your horse, or how to invite your horse to match your energy level. When you are worried, or distracted, or unsure — Go to the center of the arena, and breathe. When you breathe, deeply and from a ‘centered’ place, it’s amazing to watch your horse’s response. He slows, he looks your way, and he may even approach for a gentle nuzzle. This lesson is a perfect metaphor for the variety of reasons that people come to the Ranch: It works with parenting. It works with leadership, team building, communication, relationships, trauma recovery, and grief. Today, find the center of your ‘arena,’ the place where you bring your talents and energy to make something happen. Settle into your imaginary arena with deep breaths and a solid, steady weight on your heels. Let your shoulders drop. Stand straight and strong. Now, you’re ready to bring your whole self to your work, your relationships, your life. When you take care of yourself first, then your interactions with others come from a place of integrity, rather than from fear or distress. 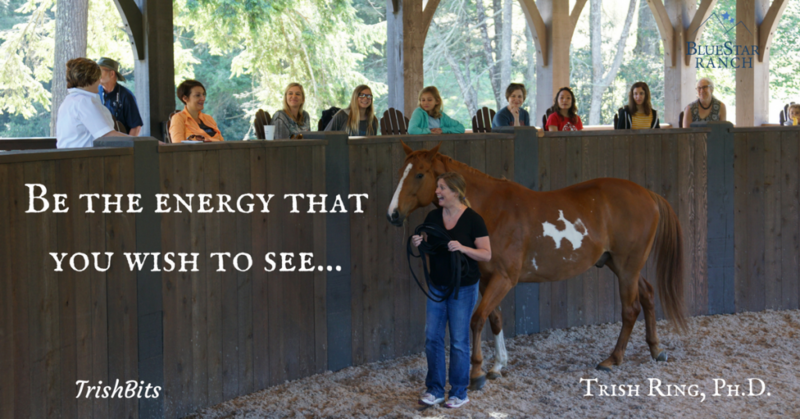 As we say at the Ranch, ‘Be the energy that you wish to see in your horse.’ And that goes for your humans, too! If you're smart, driven, successful, but just not happy, I can relate. I've been there. As a Certified Martha Beck Coach, I draw on two decades of practice as a psychologist, a big hit of intuition, plus compassion for people who try too hard and end up getting in their own way. Read more. 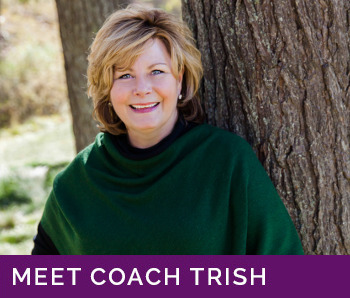 Interested in Individual Coaching sessions with Trish? Sign up here and we'll notify you when she is accepting new clients. © 2019 Trish Ring. Website & Branding by SixteenJuly.